Sience 1971 to 1976 studied in Karaganda Polytechnic Institute. Faculty: engineering and construction. Specialty: Production of building products and structures. Qualification: engineer – builder – technologist (AI number 161961). Sience 1979 to 1980 studied in Gorky Civil Engineering Institute. Specialty: Organizer of industrial production and construction. Qualifications: Organizer of industrial production. 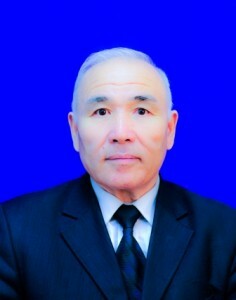 In 2003, received the degree of Doctor of Technical Sciences, (№ FD №0003246), Kazakhstan. From 1991 to the present Doctor of Technical Sciences, Professor of the Department of Building Materials and Technology. 5. 2017 – LLP “ККК Бетон”. 8. Medal of Higher Educational Institutions of the Republic of Kazakhstan “For the training of personnel with higher education”. 9. Certificate of honor of the Mayor of the Karaganda region “For active participation in the social and political life of the region and personal labor and creative contribution to the construction of a new Kazakhstan society”. 2. Member of the expert committee for consideration of investment projects of the Karaganda region. 4. Member of the Scientific Coordination Center “Safety, Technical Operation and Reconstruction of Buildings and Structures” under the Agency of the Republic of Kazakhstan for Construction and Housing and Communal Services Order No. 47 of August 24, 2009. - Expert examination, assessment of the technical condition and development of recommendations and technical solutions at the stage of the DP for the strengthening of building structures in axes 12-18, А-B of the engine room of the main building of SDPS-1. The customer is LLP “Ekibastuz SDPS-1”. Contract number 08.IR.24 from 17.06.2008. - Inspection and assessment of the technical condition of bearing monolithic reinforced concrete structures of the Trade and Residential Center buildings under construction. The customer is LLP “Asyl-2000”. Contract number 08.IR.08 from 04.02.2008. Designing enterprises of concrete and ceramic materials; Modern technologies for the production of concrete and reinforced concrete products; Extrusion concrete technology; Basics of scientific research.